Most people's eyes now glaze over when Syria is mentioned. It is confusing - just look at the above map. 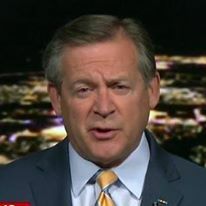 It is confusing even to those of us who have devoted years or decades of our lives trying to understand the various factors that constantly influence the situation. With forces of the Islamic State in Iraq and Syria (ISIS) removed from most of the country, the battles have again changed. The fight against ISIS was a unifying force. All parties involved in Syria, be it the Syrian government (with its Russian, Iranian, Hizballah,and other Shi'a militia supporters), the Kurds, the Turks, the various groups that comprise what is now called the "Syrian opposition" (the Free Syrian Army, independent rebels, as well as several jihadist groups, including al-Qa'idah affiliated groups) had a common enemy. With the virtual defeat of ISIS - it has lost almost all of the territory it controlled in the country, including its self-proclaimed capital of al-Raqqah - the commonality of ISIS as an enemy disappeared. The various factions in the country, as well as their sponsors, are now refocusing their efforts on each other. That means there is a greater risk of confrontation between the major players - Russia, Turkey, and the United States. The Russians, supporting the Syrian regime and allies, is focused on the annihilation of the Syrian opposition, now mainly concentrated in the Idlib governorate. The situation in northern Syria continues to deteriorate as the Syrian Army, supported by its Russian and Iranian allies, continues its vicious assault on Hamah, Idlib and Aleppo governorates. 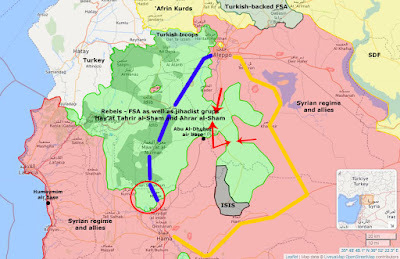 The Syrian alliance, I'll call it, is attacking the eastern portion of the rebel-held area (red arrows) – soon they will have created two small pockets which they then will reduce. In the past, they would negotiate a ceasefire and allow the fighters to depart, usually to be relocated to Idlib governorate. I wonder if they will continue that trend, allowing fighters to move west. Pretty soon, they will have no where to go as the Syrians continue to create more pockets. The air base at Abu al-Duhur is one of the objectives of the regime advance, mainly to use a a forward staging base to complement the Russian air assets from Humaymim air base on the coast. The major objective in this area, however, is the main highway that runs from Damascus-Homs-Hamah to Aleppo (blue line). It is a good road, but as you can see, in this area it is controlled by opposition forces. To maintain a supply line to its forces in Aleppo, the Syrians have been using a small desert road (yellow line) out to the east. It is a rough road through sparsely populated areas and is subject to being cut by both rebel and ISIS forces. There is an ongoing fight against the small ISIS pocket (grey) to keep that road open. I have driven both routes – given the viability of the eastern alternative, the Syrians really need to secure that main highway. They are starting to move up that highway from Hamah. In the red circle are a few small cities that are being destroyed by daily heavy Russian airstrikes. Al-Lataminah has been hit the hardest, as it is one of the first towns that will need to be taken. Note also Khan Shaykhun, site of the chemical attack that prompted the US missile attack on al-Sha'ayrat air base last year. I don’t see a good end here for the opposition forces. They are not united – they tolerate each other and occasionally work together, especially the jihadist groups. They do not have the wherewithal to withstand the force that is being applied against them. With Russian airpower and rocket artillery, and Iranian-Hizballah-various militias providing the ground forces to supplement what is left of the Syrian army, it is only a matter of time before they will be defeated. Turkish troops are also now present in Idlib governorate. 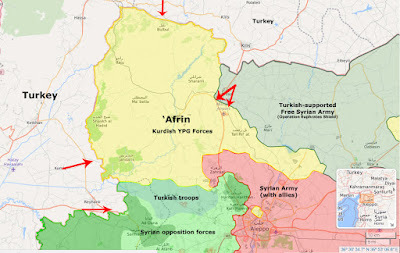 While they claim they are there to support the Russian-declared “de-escalation zones,” they are there to contain the Kurds in ‘Afrin canton. The Turks have warned of an impending offensive into the enclave – the canton is almost completely surrounded by Turkish forces. 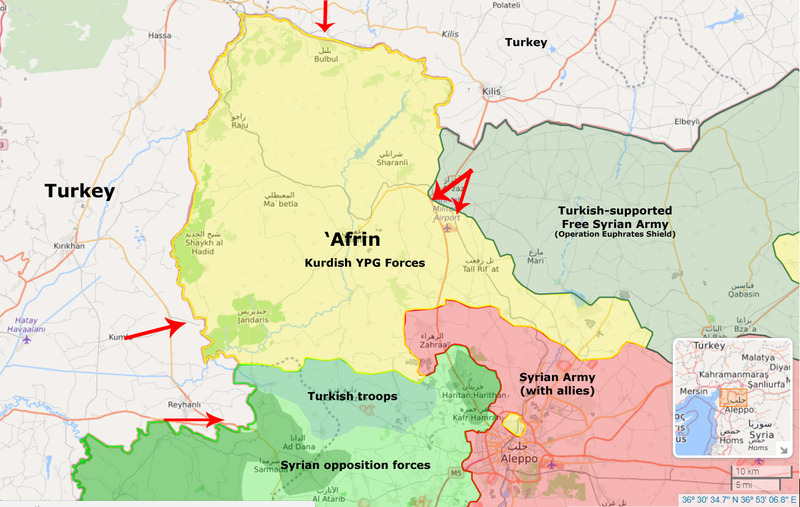 Turkish artillery has already conducted preparatory fires near the region's administrative center, the city of 'Afrin. The main assault could happen virtually any time - all it requires is the order from Turkish President Recep Tayyip Erdoğan. This will not sit well with the United States – of course, the two NATO allies have been at odds for several years over the American support (airstrikes, artillery support, equipment, training and advice) to the Syrian Democratic Forces (SDF), made up mostly of those same YPG Kurds the Turks are threatening. A Turkish military operation aimed at the very group that provided the bulk of the ground forces of the U.S.-led coalition against ISIS will only exacerbate the tense relations between Washington and Ankara. It will get even more tense. The U.S. has announced that it is training a force of 30,000 troops to control the Kurdish area of northeastern Syria, including controlling the Turkish border. The United States believes that, given Turkey's history of failing to control its own border with Syria and being the major conduit for thousands of foreign fighters into Syria to join ISIS, the SDF would be a better partner to prevent those same ISIS fighters from crossing back into Turkey to return to their countries of origin and continue the fight. The Turks are wary of any Kurdish force on the border – they regard the Syrian Kurds, including the SDF, to be nothing more than an extension of the PKK terrorist group. 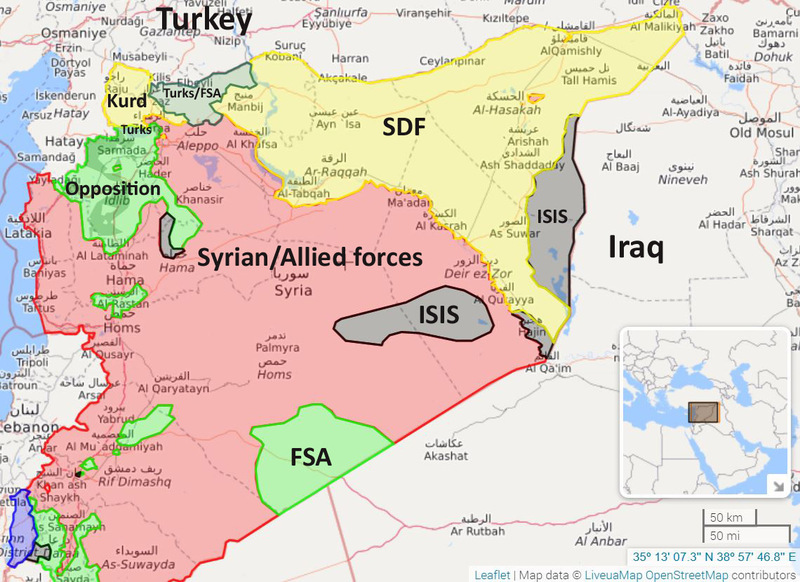 In 2016, they inserted a sizable force into northern Syria to prevent a contiguous Kurdish area running from the Iraq-Iran border in the east to the Syrian-Turkish border in the west. They claimed they were supporting the Free Syrian Army's efforts to liberate al-Raqqah. They never got closer than 80 miles to al-Raqqah, and mostly obstructed the American-supported SDF with a series of harassing attacks. The problem for the United States is the logistics of training, equipping, and maintaining a sizable force in Syria. To do so requires the ability to access the area. Given geography and political realities, that means access to eastern Syria via Iraq. That requires a continued presence in Iraq, not guaranteed after the virtual defeat of ISIS as a territorial force in the country. The Islamic Republic of Iran has major influence in both Baghdad and Damascus. I can envision a scenario in which the Iranians pressure Iraqi Prime Minister Haydar al-‘Abadi to thank the Americans for their assistance in the fight against ISIS, and ask them to leave. If he does that, how will the U.S.-led coalition continue to maintain its support to the Kurds in Syria? President Erdoğan needs to focus on the big picture here and not continue to be blinded by his hatred of the Kurds. * There are unresolved legal issues within the EU concerning the designation of the PKK as a terrorist group. The United Kingdom lists the PKK as a "Proscribed Group" rather than a terrorist group. Many believe that the U.S. and NATO designation was a political move to support NATO ally Turkey.